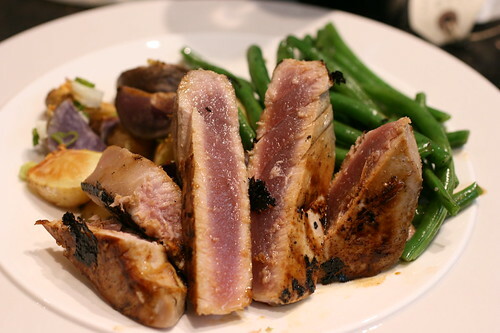 I happened to have tuna, string beans, and potatoes and I thought, perfect for a Nicoise. But, I wasn’t excited. Nicoise is pretty boring. So here’s my anti-Nicoise, still healthy, but a little Asian influence thrown in for fun. It’s actually three different dishes assembled together to make a yummy dinner. Each is very easy on it’s own. They key is to time it out for all three to be ready at once. A long time ago, Angie and I had lunch at Perry Street and the only memorable dish was a Blue Fin Tuna Burger. I’ve been wanting to recreate it, or at least a simplified version of it. It took me more than 8 months but it was worth the wait.